My Dublin Life: let it snow, let it snow, let it snow!!! Well, my Christmas shopping continues apace. 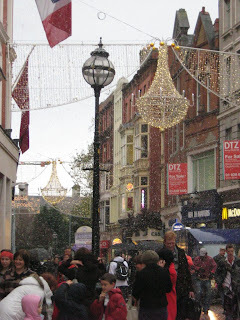 I did some shopping on Grafton Street today and to my amazement it was snowing! OK, so it's not real snow. Someone was blasting artificially made snow out of a shop somewhere. But how pretty! I hope it will snow before the holidays are over. 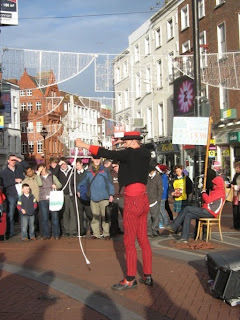 Dubliners might rush by, but for me Grafton Street is still a blast, because whatever time of day you walk down it, there are always loads of performers. Also, I've had a good idea for a present for my parents--especially because they'll be buying loads of stuff and will need all the suitcase space they can get. How about a carriage ride? That might be fun. The greengrocer down the road, source of all wisdom, told me that his brother is in the carriage business, and that their father used to work for Guinness with a cart, delivering the beer all over the city. That's how it started. 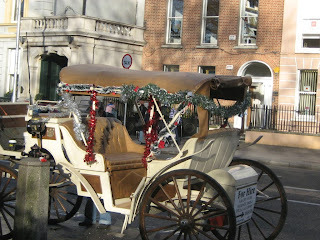 Apparently, when Guiness switched to using trucks, the cart drivers became carriage drivers! Sure looks pretty in the snow! Hope you get some of the real thing.